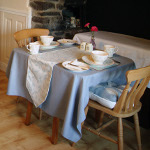 Situated in the higher part of the olde worlde village of Clovelly, overlooking the beautiful Bideford Bay, Lundy Island and the stunning North Devon coastline. Nestling between the ancient port of Bideford and the rugged cliffs at Hartland point the stunning sandy beaches of North Cornwall are only a short distance down the Atlantic coast. So if you are looking for a relaxing break with amazing scenery to investigate, then North Devon and its coastal neighbours are well equipped to give you this. If travelling by car leave the A39 at the Clovelly roundabout to the B3237, we are approximately ½ mile down on the left hand side with free off road parking available. If using public transport the bus stop is very close or walking the South West Coastal Path you will only have a short distance once leaving the track. Whatever your mode of transport on arrival you will be greeted with refreshments in our newly refurbished en-suite rooms, providing you with a relaxing stay and all home comforts. Our recently refurbished bedrooms are en-suite with views across the fields to the Bristol Channel. 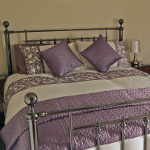 Everything you need to make your stay at Old Smithy bed and breakfast as comfortable as possible. 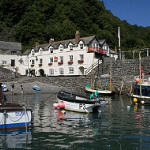 Clovelly is a small timeless village as mentioned in the doomsday book, within the Torridge district of North Devon, England.